When folks ask me for a condiment recommendation they can easily find in a local grocery store, I usually recommend something from Bone Suckin'. Their mustard is a combination of honey mustard + hot mustard = exceedingly delicious! FLAVOR - The first hit is all tang and sugar, followed by the mustard and rounded out with a mild spicy kick; truly amazing! 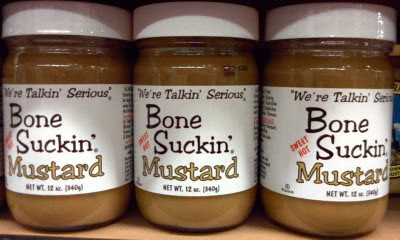 We'll be reviewing a bunch of Bone Suckin' products for The Condiment Bible: they make good stuff. This mustard is a hot dog staple here at TCB headquarters...it's also delicious on burgers, drumsticks, grilled pork ANYTHING. Do yourself (and the people you eat with) a favor and try a bottle soon. You won't be disappointed.